I can’t say I’ve ever been much of an outdoorsy type of girl. But I do appreciate the outdoors if it’s nice and clean. 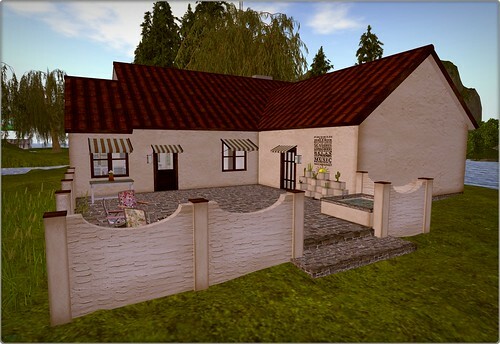 The Songo Courtyard Garden by Barnesworth Anubis for this month’s Collabor88 fits the bill just perfectly! 175 prims of lovely, this skybox is just gorgeous for if you choose to not live in a regular house, or if you just need somewhere for pictures. It comes with a few furniture pieces to match. Love! I think it’s time to relax a bit in the garden. I’ve always been a little enchanted by gypsies. Of course, when I think of gypsies, I think of Esmerelda in the Hunchback of Notre Dame. I absolutely love My Big Fat Gypsy Wedding, but well…they’re not exactly Esmerelda. Although I guess those girls do dress like some SL people! But I got to get my Disneyesque gypsy on with this new dress from Wishbox! Wanderlust is an awesome gypsy style costume! You have three options with the top. The cropped version I’m wearing here, then a longer version that comes with both long and short sleeves. It also comes with a bandana for your hair. I don’t wear a lot of flexi things any more, but you better believe I was having a blast dancing around in this outfit and watching my skirt swirl! Go to Wishbox now and get your own dress to dance in! 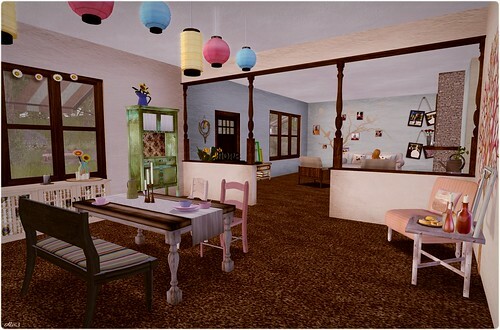 If you’re looking for something fun to do for Cinco de Mayo and you don’t have a chance to go out for margaritas, why not stop by the sim opening for FD Decor! It’s almost time for Culture Shock!!! Funky Junk is participating with the very awesome Vista house! The Vista home is 2 bedrooms/1 bathroom, and has a generous sized living room and dining area, plus a kitchen and a great back patio. There are also two gardens that just give the home an extra bit of pretty. What I really love about this home is that it’s very livable! It’s not ultra modern, or country chic, or all kinds of fancy pants. It’s a nice, normal, comfortable home, and I love that! The Vista fits on a 32×23 footprint and is 290 prims with the gardens, 220 without. It’s copy/mod/no transfer. 50% of the proceeds from this home goes to Culture Shock’s chosen charity, Médecins Sans Frontières. 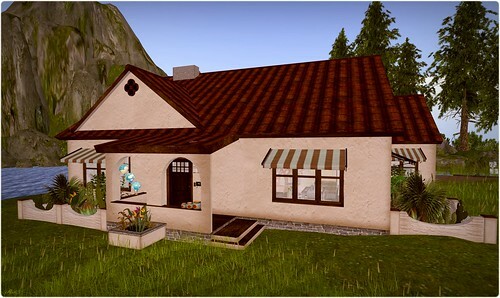 Be sure to check out the THREE matching accessories for the house that are at Culture Shock and are 100% for the charity. Great stuff for a good cause? Sign me up! Oh my god, y’all. OH MY GOD. There are SO many amazing events happening in May, you’re going to be simply run off your feet and your head will explode in happy!! I don’t even know where to start, so I’m just going to start talking. I don’t have all the SLurls for you yet [or at least, I’m not allowed to give them out yet] so don’t think I’m deliberately holding out! I will update with SLurls just as SOON as I get them/am able to post them. FaMESHed starts tomorrow, May 1st, and it’s going to be a new monthly event for MESH! All original mesh stuff, no templates!! Yeahhh baby! You guys know how much I adore mesh, so I’m super excited! This is NOT a discount event. Also starting tomorrow is the Summer Beauty Festival! This festival is all about MAKEUP! I just love makeup, don’t you? There’s been events for so many different things, it’s great that the makeup artists are getting a chance to shine! Starting on May 4th [May the 4th be with you! LMAO! ], we have Culture Shock! CHIC Management always puts on some fabulous events, as you all well know, and this promises to be amazing! I was out there earlier and the stores that have set up… Well folks, you’re going to LOVE it. There are more events coming up, so stay tuned!